I began dancing in 1975 at the tender age of 16, and despite several breakups along the way, the dance and I have been partners ever since. I have taught and performed in the Southeastern U.S., and for three years in Wellington, New Zealand. I quit dancing when I began graduate school in Classical Studies at Duke University in 1978. But I was back to it within a couple of years, dancing six nights a week at a Greek place to earn money for a trip to Greece. I spent 1980-81 at the American School of Classical Studies at Athens, visiting practically every archeological site in mainland Greece, as well as working on a photography project on Crete. I got my PhD in 1984, and went to teach at Victoria University of Wellington. While in New Zealand, I began performing and teaching dance again. After three years, I came back to the USA. Now, at the University of North Carolina Wilmington, I am an Associate Professor teaching Classical Studies and Women's Studies. I've done a lot of writing about dance; many of my articles have been published in Habibi Magazine. I gave the Keynote speech at the First International Conference of Middle Eastern Dance, and organized the academic sessions for the second. Sonme current projects: I will be teaching a course for UNC-W's Honors Scholars Program next year on "Belly Dance East and West" which will involve both academic study and a dance practicum. 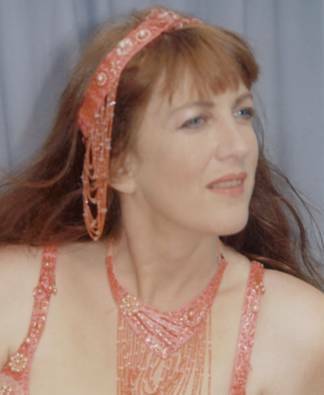 I am also at work on a general history of belly dance, from antiquity through the 1970's. I often teach local dance classes, focusing on a high-energy yet analytically based presentation of technique. I have also taught seminars, and had the pleasure of teaching and performing at the Majma dance conference in England.